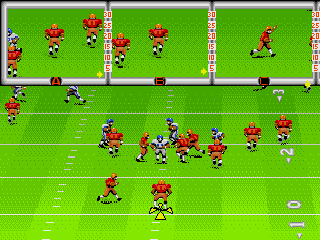 Although it had previously appeared on various home computer systems, the Genesis version of John Madden Football marked the first appearance of the franchise on a home console. While other football games like the Tecmo Bowl series and Joe Montana Football were taking the arcade-style approach with bigger plays and more scoring, the Madden series attempted to bring more realism to the table. The shining star of the game is the massive playbook, the 113 plays of which probably lend more to the authenticity of the game than anything else could. On both offense and defense the AI will call plays appropriate for the situation, meaning that you need to choose wisely to outfox your opponent. For its time, the game had impressive graphics and animation, and was clearly the best looking football game released to date. Three passing windows focused in on the three receivers involved in any passing play, but without knowing where they were located on the field, you didn’t know if you were attempting a screen pass to your running back, or launching a 40 yard bomb down the field, unless you had the play memorized. It’s hard to think of a Madden football game without any NFL or NFLPA license, but this game had neither. Instead, 16 unnamed teams from NFL cities are included, plus an “All Madden” team. With only 3 game modes – the ironically-named “regular season” (since it’s an exhibition mode), playoffs, and a sudden death/overtime scenario – the lack of a full season mode definitely hurts this game in comparison to subsequent releases. Probably the biggest drawback to this game though is that it’s just too easy, as I can run up the score on my opponents without breaking a sweat. Still, this is a historic release and is a lot of fun to play. And since it can be found just about anywhere for around a dollar, it’s definitely worth picking up just for the experience. Buy John Madden Football on GameGavel or Amazon. Tagged Football, genesis, John Madden Football, Review, sega, Sports. Bookmark the permalink.